TunesGo is a software program that aims to offer more flexibility in managing the contents of your iOS device and iTunes library. In fact, the maker's of the application, Wondershare, say that it can do things that iTunes can't — this includes an easy way to copy between multiple iDevices and convert imported media files to iOS-optimized ones. This isn't to say that TunesGo can completely replace iTunes. You'll still need to use Apple's software, but TunesGo is designed to give you convenience, coupled with additional options not found on iTunes. Probably the best way to think of TunesGo is a go-between app that fits in the middle of your iDevices and iTunes. With the promise of some iTunes-trumping options and the convenience when working with your iOS device, is it a program worth using? To see how TunesGo performed in our tests, read the full review below. Easy to export music, videos, and other content from your iOS device to any folder. The TunesGo interface is uncluttered and intuitive to use. You'll be glad to know that there isn't a steep learning curve for using this program — you can just dive straight in and start using it. This test connected two Apple devices at the same time. These were recognized after a few seconds and displayed in TunesGo. Under each device, the main options you can choose are conveniently situated on the left-hand side of the screen and permanently available to click on which helps to keep a good workflow. The options you can click are Media, Playlist, Photos, Contacts, SMS, and Toolkit. The Media menu is perhaps the one you'll use the most as it's the home for music, videos, movies, podcasts, audiobooks, and iTunes U.
Clicking one of the menus in the left window changes the main view which has further sub-menus and options to choose. Overall, the interface is responsive, well designed, and intuitive to use. You might think that iCloud keeps a backup of everything, but it only stores iTunes purchases which means music you've purchased or downloaded elsewhere isn't backed up. So, if you have lost your iTunes library and don't have a local backup then auto-syncing your iDevice could wipe out your non-iTunes songs because TunesGo prevents this from happening. When you want to backup or export content from your iOS device, TunesGo offers a flexible approach to quite a few tasks. If for example, you want to transfer songs from your iDevice then you can choose to copy to an iTunes library; a folder on your computer or external drive; or another iDevice. If updating an iTunes library from your portable, the Smart Export function is a particularly useful backup option to choose which copies only the music tracks that are missing. You can also visually see in TunesGo if a file is already in your iTunes library. Being able to directly copy from one iDevice to another is a great feature. If you've got multiple Apple devices, then it's far easier to transfer the data using TunesGo. We tried this feature out and TunesGo effortlessly copied the media directly. Before exporting files to other locations it's always handy to be able to preview your files. TunesGo comes with a simple media player for songs/videos, and also has a viewer for images. The focus in this review is on media, but TunesGo is great for quickly backing up other types of data on your iOS device too. As well as the photos menu there's also options for contacts and SMS data backup. If you have a list of contacts you want to export then TunesGo can backup to several formats which include: Vcard, CSV, Outlook Express, Outlook, and a few more. TunesGo also has a built-in contacts editor that not only enables you to change information but also comes with a duplicate finder tool for eliminating duplicates before you back up. The focus so far in this review has been on what TunesGo can do when transferring from an iDevice. However, what ​are its capabilities if you want to import media? For media, the program supports quite a good selection of formats. If it detects the files you are importing are not in an Apple format then it asks if you want to convert them to iOS-optimized versions. We tried a selection of non-Apple audio and video formats and were impressed with how well TunesGo handled the whole process. Playlists can be created too in TunesGo. You can create them from scratch and add /remove songs without having to use the Tunes software. There's also an option to add a playlist from the computer. However, rather than converting one in a particular format like WPL, M3U, etc., TunesGo takes a folder on your computer and creates a playlist out of it. We would have liked to see TunesGo import existing ones; ideally, but nevertheless, you may find this option useful. TunesGo provides a good deal of options when it comes to managing the media and data on your Apple device. The program makes tasks such as backing up and importing a breeze. For music, you can see visually if tracks are in your Tunes library or whether they need to be copied across. The Smart Export feature, in particular, a real boon when updating our iTunes library, and no worries about iTunes deleting content using automatic syncing! By default (automatic syncing) iTunes will delete media on your iOS device if it isn't found in the iTunes library (stored on your computer). Playlists can be created and edited too in TunesGo. It's nice to be able to make playlists on iTunes, but you can't create or edit Smart Playlists. 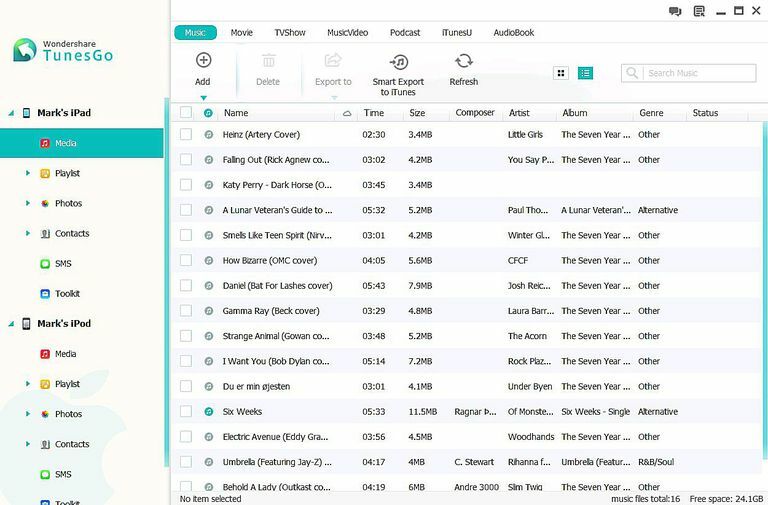 There's also an "add playlist" option, but rather than importing pre-existing playlists, the program creates one out of the contents of a folder on your computer — not ideal, but you might find a use for it. One of the biggest stand-out features of TunesGo was being able to directly transfer information from one iDevice to another. TunesGo also optimized imported content for Apple devices. Non-Apple formats were detected and converted automatically without any fuss. Managing non-media content like contacts and SMS is also a cinch using TunesGo. We loved the built-in contacts editing feature where you can search for duplicates as well as make changes. There's also a good range of formats you can import/export such as Vcard, Outlook, CSV, and more. Overall, TunesGo is a great app for managing the contents of your iOS device and iTunes library. However, the cost may ultimately put you off. That said, if you don't get on with iTunes when backing up and importing, or want a go-between app that can help you do more, then TunesGo could be the ideal solution.